- Communicating what the results mean in financial terms. Their skills in analysis and modelling of problems in finance, risk management and product design are used extensively in the areas of insurance, pensions, investment and more recently in wider fields such as project management, banking and health care. Within these industries, actuaries perform a wide variety of roles such as design and pricing of product, financial management and corporate planning. Actuaries are invariably involved in the overall management of insurance companies and pension, gratuity and other employee benefit funds schemes; they have statutory roles in insurance and employee benefit valuations to some extent in social insurance schemes sponsored by government. Where can Actuaries find work in India? Consulting: Tower Watson, Mercer, Milliman, Deloitte, WNS, Genpact, AonHewitt, Ernst & Young, and many others. 2) Pass the exams conducted by the Institute of which you are a student member. The ACET tests students on Mathematics, Statistics and some basic English. The syllabus for Foundation ActEd Course (FAC), which includes Maths and English can be viewed here. The syllabus for Stats Pack (Statistics) can be viewed here. An online application has to be made for registration for ACET. A fee of Rs. 3000/- has to be paid through online mode itself. The form can be accessed here. Q. What is the structure of Exam? e.g. Duration, distribution of questions, marks and others. Q. Is there any penalty (Negative Marking) for wrong answers? A. Yes, there would be negative marking for incorrect answers. The incorrect answer will deduct half of the weight age of marks e.g. for an incorrect answer to a 1 mark question 0.5 mark will be deducted and for an incorrect answer to the 5 marks question 2.5 marks will be deducted. A. The results are normally declared within 10 days from the date of the exam. The results would be available on the IAI website. Q. What steps have to be taken after passing ACET? A. To know steps and procedures to be followed after passing ACET, click here. After passing ACET, one has to register as a student member with the IAI. The Student Membership Application Form can be accessed here. The details of examination fees for each paper can be viewed here. The examination schedule for the October 2015 session can be viewed here. 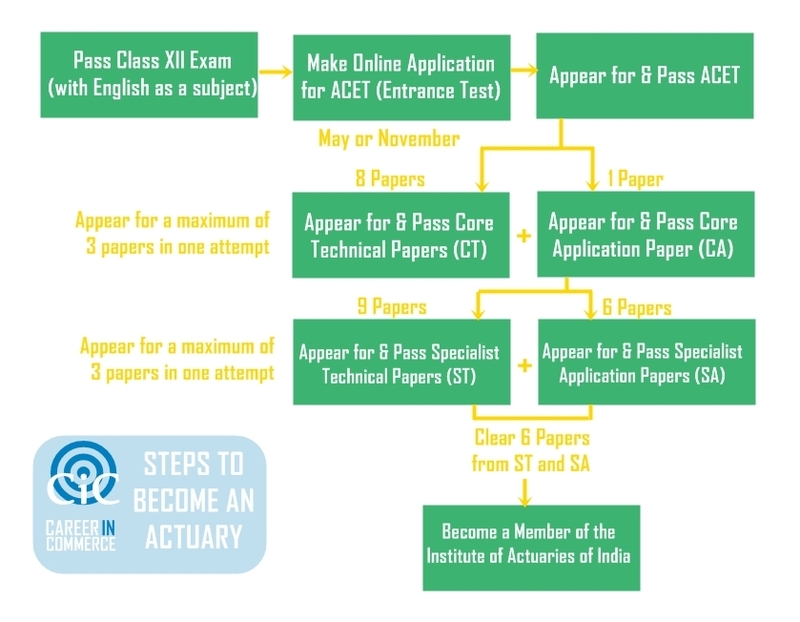 Disclaimer: Career in Commerce is only trying to compile information from various sources on the internet, including from the website of the Institute of Actuaries of India, to give students of commerce a bird's eye view of the actuarial sciences course. All the relevant hyperlinks on this page are directly linked to the IAI website. CiC is neither providing any coaching classes for actuarial sciences nor distributing any of its study material.